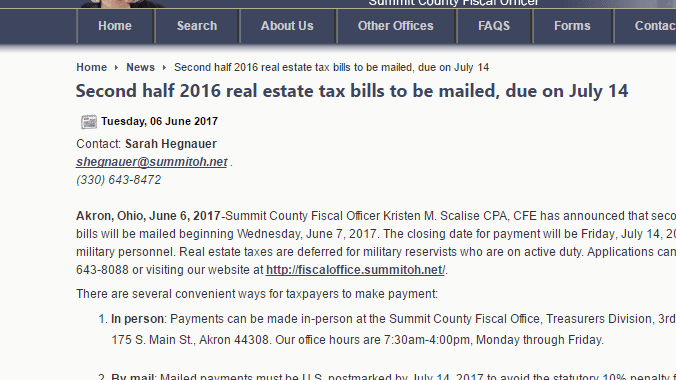 A recent release on the Summit County Fiscal Officer’s website, Second half 2016 real estate tax bills to be mailed, due on July 14, reminds all property owners in Summit County that the second-half 2016 real estate tax bills were mailed on June 7, 2017 and due by July 14. The article is also a reminder to property owners in Summit County that it is the property owner’s responsibility to obtain and pay their tax bills on time, so if you haven’t yet received your property tax bill, click on the link above for contact information. Worried that your Summit County tax bill is too high? Is the appraised value by the county accurate? How can you appeal the appraised value Summit County is basing your tax bill on? These questions are answered on our page Appealing Your Summit County, Ohio Property Tax Values which we created at the end of 2015 when Summit County property tax assessments were being conducted and mailed to property owners. Taxpayers who do not agree with the valuation of their property had the opportunity to file a complaint with the Board of Revision for review of property values through March 31, 2017. When a complaint is filed, the Board of Revision schedules a hearing, reviews evidence and testimony, and issues a decision on whether a correction should be made to the valuation. Typically the property owner will submit evidence, usually what we call a tax appraisal, or tax appeal appraisal, from one of our certified appraisers. Although that appeal process was back when Summit County was mailing new property value assessments, if you acquired the property recently and weren’t the owner when the real estate was assessed, there may be a process for appealing the county’s appraised value now. However, it’s more likely that if you purchased the property since the Summit County appraisal, the property tax was disclosed and you will be responsible for paying the property tax bill on time. If you feel your Summit County real estate has been overvalued by the county and you are too late to appeal the most recent valuation, the triannual appraisal updates are conducted again in 2017. Call the county to submit evidence of why you feel your property has been over-valued and you may be able to get the property tax assessed value lowered for your next tax bill. Be sure to offer evidence supporting your claim to a lower property valuation, or order a tax appeal appraisal from the certified appraisers at Fast Appraisals and the officials at Summit County will likely be more inclined to take your request seriously. Call us at 216-932-4663 and we’ll be happy to discuss your property valuation questions. Posted in Residential Property Appraisals, Summit County, Tax Appeal Appraisal and tagged summit county appraisal, summit county ohio tax valuation appeal, summit county property appraisal, Summit county tax appraisal, Tax Appeal Appraisal.